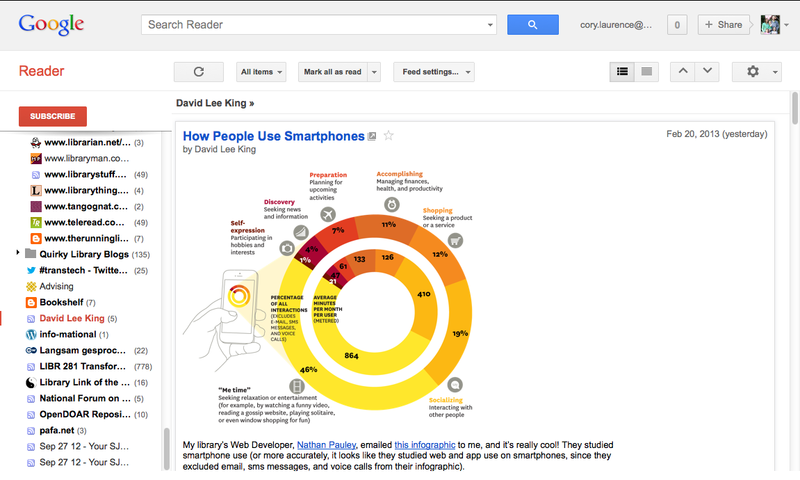 NOTE: By now you have probably heard the news that Google Reader is being shut down in July. We’ve decided to leave this week’s module as-is because the basics of using an RSS-aggregator are still useful. However, we’ve added a bonus activity at the end, and encourage you to explore alternatives to Google Reader for the future. Let us know in the comments on this page or in your personal blog postings this week if you have found an alternative site that you like. We would love to know about it! You can also add sites that do not have the orange RSS button. Go to a blog & click the orange RSS button. Don’t forget to write about your experience with Google Reader (frustrations, epiphanies, or indifference!) on your personal blog. This Learning 2.0 module was originally designed and implemented by students in Dr. Michael Stephens‘ Transformative Literacies class in the Spring of 2013. This class is part of San Jose State University’s School of Library and Information Science curriculum. It was authored by Cory Laurence for the East Greenbush Community Library. It is available for use for other libraries or institutions. This work is licensed under a Creative Commons Attribution-NonCommercial-ShareAlike 3.0 Unported License. Special thanks to Helen Westwood for her work from which this module has been adapted.